Research Matters / Does Arts Education Matter? "Zombie" findings aside, arts education has unique benefits for students. Two decades ago, Georgia governor Zell Miller announced a plan to freely give out classical music CDs to parents of all newborns in the state in hopes of harnessing the power of the "Mozart effect"—the supposed link between listening to classical music and brain development. At the time, many companies had seized upon the idea, peddling videos, music, and crib toys marketed to help parents turn their infants into baby geniuses. Alas, within a few years, claims about the Mozart effect—flimsy to begin with—would be all but debunked. For starters, the original study had shown only a mild, temporary boost in performance for college students (not babies) listening to a Mozart sonata while performing a spatial reasoning task. Moreover, researchers were unable to replicate the effects, which led a team from the University of Vienna (Mozart's hometown) to conclude, from a meta-analysis of 40 studies with 3,000 participants, that listening to classical music had no effect on spatial skills (Pietschnig, Voracek, & Formann, 2010). no convincing link between visual arts and reading achievement. Nonetheless, claims that the arts promote other forms of learning persist—a zombie idea that keeps coming back to life no matter how often it's put to rest. So, does that mean arts education isn't valuable? Not at all. Rather, the persistence of these claims may reflect the fact that we ask arts education to do something we seldom ask of other forms of education: justify itself in light of its effects on other fields. How often do we, for example, ask athletic directors to prove that playing baseball leads to better math skills or improves verbal skills? Hetland and Winner (2001) noted that "the arts are the only school subjects that have been challenged to demonstrate transfer as a justification for their usefulness" (p. 5). But maybe listening to Mozart can make us smarter not because it hones our brains for other knowledge and skills assessable on high-stakes tests, but in a more straightforward way: because it teaches us more about Mozart and music. Why complicate this? As Jacob Pietschnig, lead author of the study that laid the "Mozart effect" to rest commented, "I recommend listening to Mozart to everyone, but it will not meet expectations of boosting cognitive abilities." Maybe instead of looking for research to prove or disprove the transfer of skills from the arts to something purportedly more important (or utilitarian), we should ask a different question altogether: What unique benefits does studying the arts provide students? Asking this question paints a different picture (pardon the pun) of arts education. To wit: Against a backdrop of "enrichment" field trips being eliminated or replaced with "reward" field trips to amusement parks and the like, Jay P. Greene and colleagues at the University of Arkansas conducted what they believed to be the first-ever randomized trial of the effects of field trips to art museums and live theater performances. Museum trips, they found, do precisely what they're supposed to. Students of varied backgrounds chosen randomly to tour an art museum "[improve] in their knowledge of and ability to think critically about art, display stronger historical empathy, develop higher tolerance, and are more likely to visit such … institutions … in the future" (Greene, Kisida, & Bowen, 2014, p. 80). Meanwhile, students selected at random for theater outings demonstrated better knowledge of plot and vocabulary associated with the show as well as higher scores on a scale of reading other people's emotions—a measure taken on average 47 days after the show, suggesting more than a temporary benefit (Greene et al., 2015). Moreover, as reported recently in this column (Goodwin, 2017), studies show that music and art therapy programs can have significant effects on cognitive development, behavior, and self-concept, and significantly reduce PTSD symptoms for students who've experienced psychological trauma. As the Arkansas team concluded from their study of students attending live theater, "schools produce important educational outcomes other than those captured by math and reading test scores" (Greene et al., 2015, p. 61). Arts education, in other words, has its own intrinsic value. 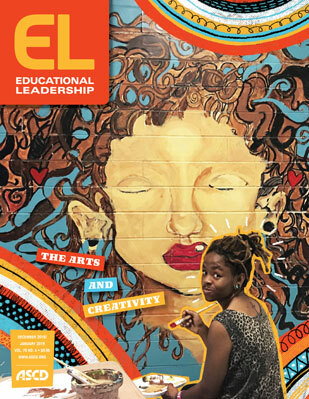 An arts education serves important purposes for students beyond the limited outcomes captured on standardized tests, including something as important (if not more important than) scoring well on a test or becoming a baby genius—namely, learning to lead a life well lived. That's something school leaders shouldn't lose sight of. Eisner, E. W. (1998). Does experience in the arts boost academic achievement? Arts Education Policy Review, 100(1), 32–40. Goodwin, B. (2017). Research matters: A "special" answer for traumatized students. Educational Leadership, 75(4), 78–79. Greene, J. P., Hitt, C., Kraybill, A., & Bogulski, C. A. (2015). Learning from live theater. Education Next, 15(1), 54–61. Greene, J. P., Kisida, B., & Bowen, D. H. (2014). The educational value of field trips. Education Next, 14(1), 78–86. Hetland, L., & Winner, E. (2001). The arts and academic achievement: What the evidence shows. Arts Education Policy Review, 102(5), 3–6. Pietschnig, J., Voracek, M., & Formann, A. K. (2010). Mozart effect–Shmozart effect: A meta-analysis. Intelligence, 38(3), 314–323. Bryan Goodwin is the president and CEO of McREL International and the author, most recently, of Out of Curiosity: Restoring the Power of Hungry Minds for Better Schools, Workplaces, and Lives (McREL, 2018). Eric Hubler, a former education reporter, is a writer and editor at McREL International.